Bruegel's painting “The Hunters in the Snow” provides the basis for a young girl and a bird she nurses back to health in medieval times. Young children will see it on one level, older children and adults on another. A pair of birds on a snowflake-filled journey explore how everything everywhere is unique from branches and trees, leaves and forests to friends and loved ones. Explores migration, hibernation, and staying-in-place of birds, animals, and insects. A family has their own holiday tradition of decorating a live tree in the forest with popcorn, seeds, and fruit for the forest creatures. Join Audubon board members Juliet D’Souza and Nancy Ocken for a popular monthly series call Wildlife Wednesdays at the Freeport Public Library. This includes a special story time with activities related to a monthly theme. They often bring specimens of "critters!" This activity is most fun for two to seven year olds. 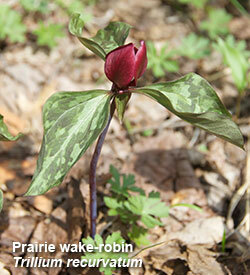 To learn more about this activity, check out the NWIL Audubon Dec./Jan. Newsletter, page 8 and 9. 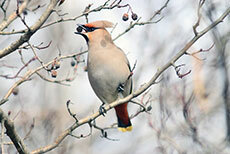 Not all the birds leave or migrate from our area in the winter...so what do birds eat during our winters? Juliet D’Souza will teach the kids about winter feeding and have them make pine cone bird feeders to take home with them. She will lead a short hike around Oakdale to gather some pine cones and look for any creatures along the way. Kids of all ages and their families are welcome! Binoculars will be available for the kids to use and all of the materials to make the bird feeders. Sign-ups are encouraged. Contact Juliet at 201-233-0946. Meet at the Mogle Building at 9:30 a.m. If you are not sure about the weather that day, call Juliet before the event. Juliet D’Souza will lead a winter hike to search for signs of wildlife. 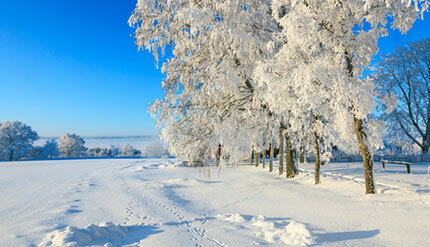 Dress for the weather including footwear that protects your feet from snow. Kids of all ages and families are welcome! Sign-ups are encouraged. Contact Juliet at 201-233-0946 and meet at the Mogle Building at 10:00 a.m. If you are not sure about weather, call Juliet before the event. This active little woodpecker should be showing up around your feeders right about now. You might also see him at a local park or woodland joining flocks of chickadees and nuthatches. He often moves about in funny ways, upside-down and sideways and can balance on tiny branches and twigs. If you put out some suet, the Downy Woodpecker might stop by for some supper! He has a larger look-alike, the Hairy Woodpecker, and learning to identify the difference between these two woodpeckers is a challenge for beginning birders to master. Can you look up a picture of the Hairy Woodpecker and find things that are the same and different between the two birds? 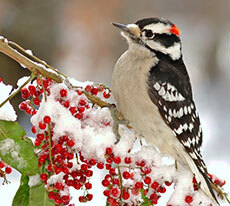 Right about now, in the winter, Downy Woodpeckers often join flocks of other birds. This helps them to look out for predators and find food. The Downy Woodpecker likes to eat insects living on or in the stems of weeds. You might see them hammering at goldenrod galls to get the fly larvae inside. Woodpeckers don’t sing songs, but they drum loudly on wood or metal to get their message across. They eat pests like the corn earworm, tent caterpillars, and apple borers. If you put out suet, millet, peanuts, chunky peanut butter and black oil sunflower seeds at your feeder, they might stop by. If you live close to Freeport, you can track this woodpecker and other birds by participating in the Christmas Bird Count Feeder Count. See the NIAS Dec./Jan. newsletter, page 5 for more information about this fun activity. 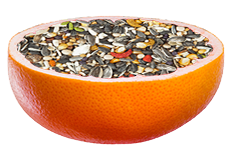 Fill an empty grapefruit half with birdseed and suspend with rope or wire from branch. Next time it's snowing, chill a sheet of black construction paper in the freezer for 30 minutes; catch snowflakes on it. Look at each snowflake with a magnifying glass. 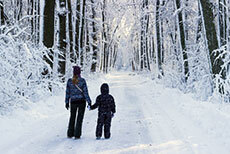 Take a winter walk around the yard, around the neighborhood, or at the park or nature preserve. Make a list of wintering birds, berries, tracks, tunnels  and don't forget to look under logs to see what is sheltering there. Replace log. Then go in and have hot chocolate and snacks and talk about discoveries. For very young children: hide stuffed animals in the yard, then go on a safari to find them; along the way, note the real animals, birds and other signs of winter. Build a snow fort. 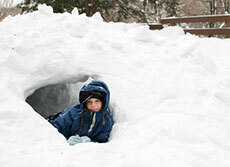 Pile snow, excavate a wide entrance and shovel out a place to sit.